I'll be away on vacation until July 5 at a cottage without phone or computer. It will be good to unplug and recharge. See you after the holiday! Newswise (06/27/06) — Pomegranate juice packs a punch on prostate cancer that prolongs post-surgery PSA doubling time, drives down cancer cell proliferation and causes prostate cancer cells to die, according to a study published in the July 1 issue of Clinical Cancer Research. “The velocity of the increase in PSA is decreased by 35 percent among those who drank the pomegranate juice,” said Allan Pantuck, M.D., associate professor, Department of Urology, David Geffen School of Medicine, UCLA, and lead author of the paper. “We are hoping that pomegranate juice offers a novel strategy for prolonging the doubling time in men who have been treated for prostate cancer,” Dr. Pantuck added. “Pomegranate is high in antioxidants, and there is good evidence that inflammation plays an important role in prostate cancer,” he said. As with vitamin C and other antioxidants, ellagic acid – a primary antioxidant in pomegranate juice – works to quench molecules that oxidate, or add oxygen, to cellular and circulatory proteins and fats, altering their biological function. “We don’t believe we are curing anyone from prostate cancer,” he said. “In our initial trial, although a third of patients experienced a decrease in their PSA during the study, nobody’s PSA went to zero. Dr. Pantuck’s colleagues who contributed to this study included Ignarro, John Leppert, Nazy Zomarodian, William Aronson, Jenny Hong, James Bernard, Navindra Seeram, Harley Liker, Hejing Wang, Robert Elashoff, David Heber, and Arie Belldegrun from the departments of Urology, Medicine, Physiologic Science or Biomathematics at the David Geffen School of Medicine, UCLA. Michael Aviram from the Technion Faculty of Medicine, the Rambam Medical Center, Bat – Galim, Haifa, Israel, also contributed to these studies. This week's Veggie Hero is Jon Camp, the hard working outreach coordinator for Vegan Outreach. 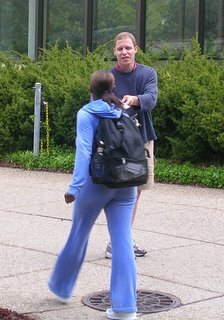 He has been actively leafleting for Vegan Outreach for four years and has been an employee for about two years. Jon has handed out an amazing 160,000 copies of "Why Vegan" and "Even If You Like Meat" booklets in that time -- mostly at colleges across the nation. He has also distributed more than 80,000 pro-veg booklets for other groups. Jon lives in Takoma Park, Maryland. I've been vegetarian for a little over 11 years, vegan for a little over eight years. In the spring of 1995, I took an ethics course at the College of Lake County in Grayslake, Illinois. My professor spent one day explaining what animals endure on factory farms and in slaughterhouses. Moreover, he gave some convincing arguments as to why this should possibly be of moral concern to us. As I'd considered the issue before and always had a sense of empathy for animals, I was convinced and went vegetarian that day. After reading about the issue more, I eventually went vegan. While I try to be one who dwells on the positive, I've found it quite easy to get vegetarian food about anywhere. During the last two schooI years I've driven around pretty much most of the eastern half of the United States as well as the south, handing out booklets at colleges. I can't remember going hungry once. The amount of vegetarian and vegan food available at mainstream supermarkets and restaurants continues to increase daily. I live far away from most of my family so holiday dinners tend to be by myself or with some fellow vegans. That said, members of my family (some of them veg, some not) are quite respectful of my veganism and I've always found that treating others with a sense of courtesy and kindness is in the animals' best interests. I'm a man of frugality and tofu tends to be cheaper. I started off the morning with a banana and some orange juice, worked out and then throughout the morning, while at my computer, filled my belly up with two bagels (one blueberry with soy margarine, one multigrain with apple butter). Seventh-Day Adventists have long been on the cutting edge of healthy eating. Today, many followers of this Christian faith are vegans. 3ABN, a international Seventh-Day Adventist cable television station, airs a number of fine vegan cooking programs. "Let's Cook" airs on Tuesday mornings at 8:30 a.m. EST and Thursday afternoons at 2:30 p.m. EST. "3ABN Today" airs at at 9 a.m., 4 p.m. and 10 p.m. EST each Wednesday. "Food For Thought" airs on Monday mornings at 8:30 a.m. EST and Tuesday afternoons at 2:30 p.m. EST. You can watch in real-time online at: http://www.3abn.org/. 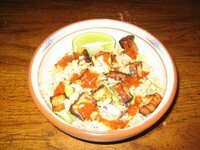 The recipes are also posted each week. Now, we just need to get the Food Network on board! 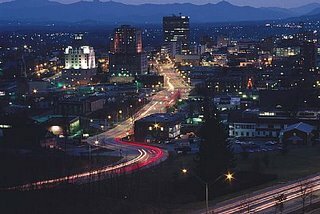 Asheville, my lovely hometown, has been named one of the top 12 "Best Veg-Friendly Places to Live" in the new issue of VegNews! In addition, many of our great restaurants offer great veg fare. And be sure to delve into the green wilderness surrounding our city -- Asheville is circled by more than a million acres of national forests! 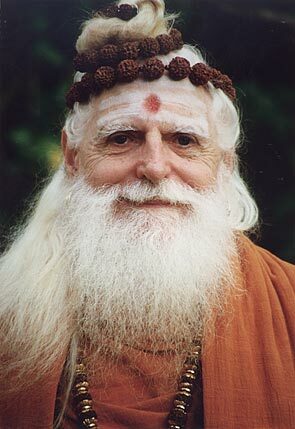 Hinduism is arguably the world’s oldest religion. This venerable tradition has much to teach us, including how to better practice “ahimsa,” or nonviolence. Sloka 69 - Is Vegetarianism Integral to Noninjury? The abhorrence of injury and killing of any kind leads quite naturally to a vegetarian diet, shakahara. The meat-eater's desire for meat drives another to kill and provide that meat. The act of the butcher begins with the desire of the consumer. Meat-eating contributes to a mentality of violence, for with the chemically complex meat ingested, one absorbs the slaughtered creature's fear, pain and terror. These qualities are nourished within the meat-eater, perpetuating the cycle of cruelty and confusion. When the individual's consciousness lifts and expands, he will abhor violence and not be able to even digest the meat, fish, fowl and eggs he was formerly consuming. India's greatest saints have confirmed that one cannot eat meat and live a peaceful, harmonious life. 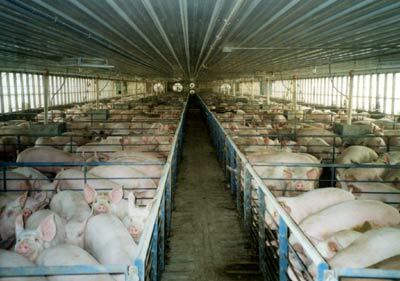 Man's appetite for meat inflicts devastating harm on the earth itself, stripping its precious forests to make way for pastures. The Tirukural candidly states, "How can he practice true compassion who eats the flesh of an animal to fatten his own flesh? Greater than a thousand ghee offerings consumed in sacrificial fires is not to sacrifice and consume any living creature." Aum Namah Sivaya. 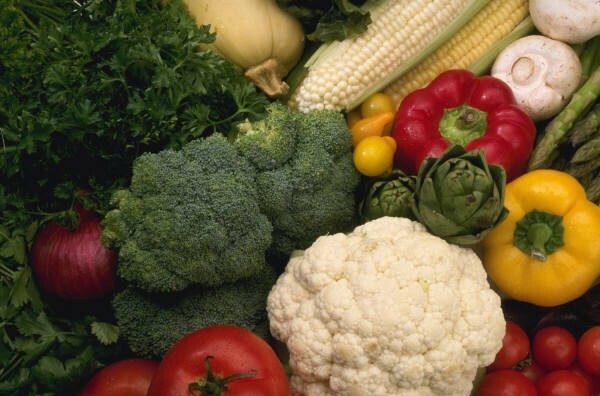 Newswise (06/19/06) — New research suggests one reason vegetables may be so good for us – a study in mice found that a mixture of five common vegetables reduced hardening of the arteries by 38 percent compared to animals eating a non-vegetable diet. Conducted by Wake Forest University School of Medicine, the research is reported in the current issue of the Journal of Nutrition. The study used specially bred mice that rapidly develop atherosclerosis, the formation on blood vessel walls of fatty plaques that eventually protrude into the vessel’s opening and can reduce blood flow. The mice have elevated low-density lipoprotein ( LDL), or “bad” cholesterol, which is also a risk factor for atherosclerosis in humans. Half of the mice in the study were fed a vegetable-free diet and half got 30 percent of their calories from a mixture of freeze-dried broccoli, green beans, corn, peas and carrots. These five vegetables are among the top-10 vegetables in the United States based on frequency of consumption. After 16 weeks, the researchers measured two forms of cholesterol to estimate the extent of atherosclerosis. In mice that were fed the vegetable diet, researchers found that plaques in the vessel were 38 percent smaller than those in the mice fed vegetable-free diets. There were also modest improvements in body weight and cholesterol levels in the blood. The estimates of atherosclerosis extent involved measuring free and ester cholesterol, two forms that accumulate in plaques as they develop. The rate of this accumulation has been found to be highly predictive of the actual amount of plaque present in the vessels. Adams said it is not clear exactly how the high-vegetable diet influenced the development of plaques in the artery walls. “Although the pathways involved remain uncertain, the results indicate that a diet rich in green and yellow vegetables inhibits the development of hardening of the arteries and may reduce the risk of heart disease,” said Adams. He said that a 37 percent reduction in a certain marker of inflammation in mice suggests that vegetable consumption may inhibit inflammatory activity. Numerous studies in humans have shown that a high-vegetable diet is associated with a reduced risk of cardiovascular disease, as well as with reductions in blood pressure and increases in “good” cholesterol. This is believed to be the first study to address the effect of increased vegetable consumption on the development or progression of atherosclerosis. Despite compelling evidence supporting the health benefits of increased vegetable consumption, intake remains low, Adams said. The mean consumption is 3.2 servings per days, with about 40 percent coming from starchy vegetables such as potatoes. The research was funded by the General Mills Company, which supplied the freeze-dried vegetables. Co-researchers were Deborah Golden, B.S., Haiying Chen, Ph.D., Thomas Register, Ph.D., all with Wake Forest, and Eric T. Gugger, Ph.D., with the Bell Institute of Health and Nutrition, General Mills Company. The cholesterol analysis was performed by the Core Lipoprotein Laboratory of the Department of Pathology/Lipid Sciences at Wake Forest. The discovery of a new strain of mad cow disease that may strike spontaneously rather than through contaminated feed could mean that it will be impossible to completely stamp out the brain-destroying illness in cattle. The only two cases of mad cow in U.S.-born cattle, found in Texas and Alabama, were a different form of the disease than the strain commonly found in Europe, French prion researcher Thierry Baron told scientists at a meeting in London in May. Baron believes it is likely that the two U.S. cases — and at least five others found in France, Italy and Germany — occurred in a way that is strongly reminiscent of the most common human form of the disease, which is also not blamed on a contaminant. More research is necessary to know for certain, Baron said in an e-mail sent last week to USA TODAY. If it can appear out of thin air to infect cattle as it does humans, "we may never be able to get rid of the disease," says Jean-Philippe Deslys, central coordinator of NeuroPrion, the network that coordinates European prion researchers. Mad cow disease is known to scientists as bovine spongiform encephalopathy, or BSE. It is caused by infectious, misfolded proteins called prions. 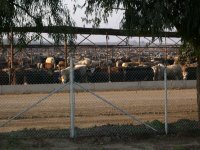 For most of the past decade, officials have focused their prevention efforts on banning the use of feed contaminated with infected cattle parts, believed to be the primary conduit of the disease. Creutzfeldt-Jakob Disease (CJD) is the most common human form of prion disease. In almost 90% of U.S. cases, the prions spontaneously appear in the brain of CJD victims. About one in 1 million people, generally after age 60, are struck with the disease each year. Another 5% to 10% of CJD cases are tied to a genetic mutation. A similar but different disease is variant Creutzfeldt-Jakob, which people get from eating BSE-infected cattle. No one has acquired variant CJD in the USA; worldwide it has killed about 150 people. Baron is quick to point out that it's not known if the spontaneously occurring form of mad cow can be transmitted by eating infected tissue. Caroline Smith DeWaal, food safety director at the Center for Science in the Public Interest in Washington, D.C., says it's too early to say if this new strain is spontaneous. "But it does mean that ensuring that high-risk cattle material stays out of both human and animal cattle feed is essential," she says. John Clifford, chief veterinarian of the U.S. Department of Agriculture, says feed bans across the globe have done an excellent job of stopping the transmission of mad cow. To him, what's most telling is that the number of cases is declining in cattle worldwide, as is the number of cases of variant CJD. That's "a good indication that we're doing the right thing in control and eradication of this disease," he says. Sometimes you just want the taste of something different. 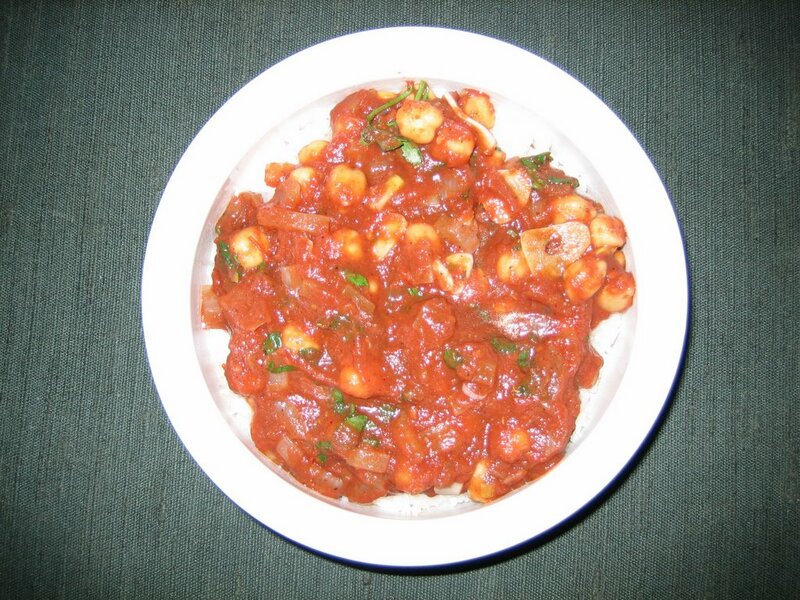 Chana masala fits that bill nicely. This wonderfully fragrant and delicious dish from India is perfect. It doesn't take long to make and the ingredients can easily be found in a large grocery store. 1. Heat oil in a large skillet over medium-high heat. Add onions and cook until they begin to brown. Add garlic, jalapeno and cumin. Cook 1 minute more. 2. Add tomatoes, chickpeas, garam masala and sea salt. Reduce heat to low, and simmer 10 minutes. 4. Serve over hot basmati rice. To me vitamin B12 is one of the most interesting vitamins. Marginal vitamin B12 deficiency is fairly common, largely not because of insufficient intake, but because it requires a complex set of circumstances to be absorbed. In order to be absorbed, one's stomach needs to be sufficiently acidic and the body needs to make a substance called intrinsic factor. In the presence of an acidic environment in the stomach, intrinsic factor complexes with vitamin B12. Intrinsic factor is required for vitamin B12 to be absorbed in the intestines. Acid is required for intrinsic factor and B12 to complex together. Elders and people with ulcers caused by bacterial overgrowth in the stomach often do not have sufficiently acidic environment for the vitamin B12 to complex with intrinsic factor. Also some individuals do not make enough intrinsic factor. In both of these cases, adding more B12 through the diet or supplements will not solve the problem. This is when B12 shots directly into the tissue become necessary (bypassing the absorption step). Individuals with bacterial overgrowth in their stomachs and duodenums can often be treated (and in most cases should be) when this happens, the stomach can often return to its normal acidic state, and B12 shots will not be necessary. Frank deficiency is a real concern because it can cause irreversible nerve damage. Because vitamin B12 is needed for the breakdown of homocysteine (an independent risk factor for coronary heart disease), even marginal deficiency should be avoided. Most omnivores do not need to worry about consuming enough vitamin B12 -- there is plenty in animal products to meet one's needs. And humans generally store up to about a five-year supply in the body which makes thinking about this vitamin more relaxed! Vitamin B12 is made by bacteria in the guts of animal (including humans although we don't get much that way because we make it in the large bowel and its not absorbed well from there) and in most animals is then absorbed and incorporated into the tissues and secretions (meat, milk, etc.). I do recommend fortified foods or supplements for vegans. In fact, it is really important for vegans to pay attention to getting a fairly regular supply of B12. 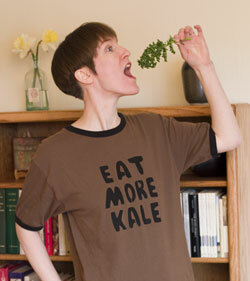 Vegetarians consuming three daily servings of dairy products probably do not need to supplement, but it wouldn't hurt. Good vegan sources include nutritional yeast, fortified cereals, fortified veggie meats, fortified soy and rice milks, and supplements. Any vitamin source containing B12 is fine. I prefer a high dose B12 only supplement that is used weekly rather than having to remember to take something daily. I like the sublingual or chewable versions because some absorption can happen through the mouth. The body will not absorb more than will be beneficial and it does store a fairly good supply so the periodic use of a supplement along with regular use of a fortified food source is more than sufficient. -- Dr. Lanou is a Senior Nutrition Scientist for the Physicians Committee for Responsible Medicine and Assistant Professor of Health & Wellness University of North Carolina at Asheville. Article reprinted with her permission. 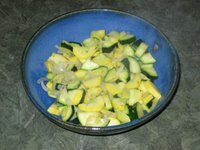 Tender, young summer squash is beginning to be available at my local farmer's market. 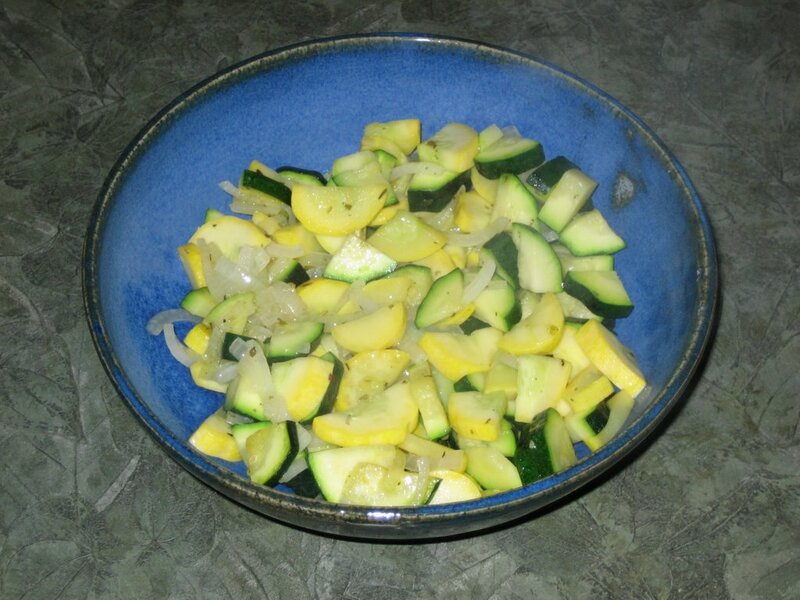 It's a wonderfully quick cooking vegetable that makes a nice side dish for a sandwich. Perfect for a night when you don't really feel like cooking but want something fresh. 1. Heat olive oil in a large skillet over medium heat until it begins to shimmer -- about one minute. 2. Add all other ingredients. Cook 7-10 minutes, stirring occassionally, until squash is tender. Pancakes make a wonderful weekend breakfast. These pancakes are packed with nutrition and taste great, too! I worked on this recipe for months, getting it just right. The combination of wheat flour and cornmeal is the secret! 1. In a medium bowl, whisk together flour, cornmeal, flax seed, baking powder and sea salt. 2. Add soymilk, canola oil and maple syrup. Mix until just combined. 3. Lightly spray a large skillet with cooking oil and warm over medium-high heat. 4. 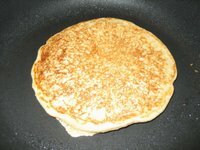 Measure about 1/3 cup of batter onto the hot skillet. Flip pancake when bubbles appear and burst on the upper surface, about 2 minutes. Cook for another 2 minutes or until set. 5. Serve immediately with warm maple syrup and butter. On special mornings, don't you long for a celebratory breakfast? 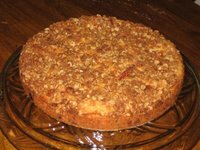 Try this wonderful Blueberry Streusel Coffee Cake. It is full of whole grains, unprocessed sugars and juicy blueberries. 1. Preheat oven to 350 degrees. Lightly grease a 10-inch spring form pan. Set aside. 2. Begin by preparing streusel topping. In a small bowl, combine sugar, oats, pecans, flour, cinnamon and nutmeg. Cut in oil and mix until mixture is crumbly. Set aside. 3. Next prepare the cake batter. In a medium mixing bowl, combine flours, baking powder and sea salt. Remove 1 tablespoon of flour mixture, sprinkle over blueberries and toss to coat. 4. Add oil, maple syrup, soymilk and vanilla to flour mixture. Mix until just combined. Turn in coated blueberries. 4. Pour batter into prepared cake pan. 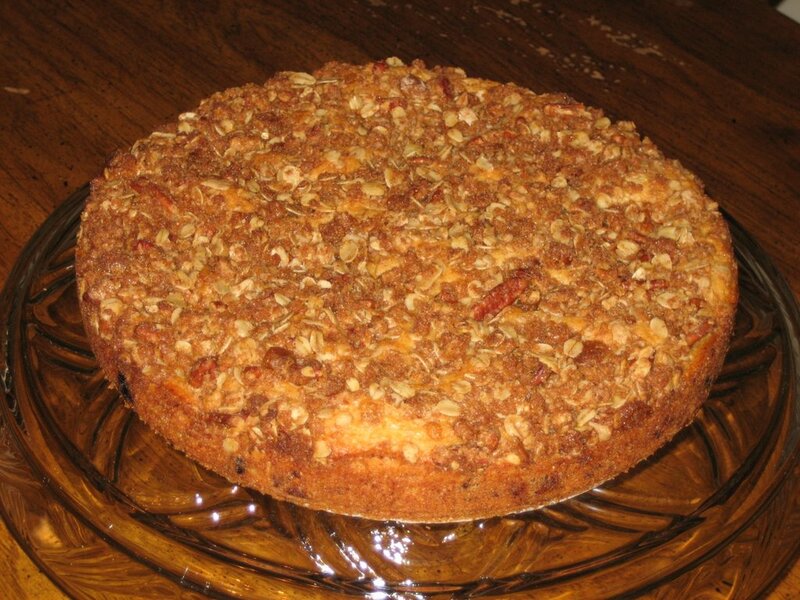 Top evenly with streusel. 5. Bake cake for 40-45 minutes or until probe inserted into the center comes out clean. 6. Cool on a wire rack for 10-15 minutes. Remove from pan and continue cooling. 7. Serve warm. Cover any leftovers. 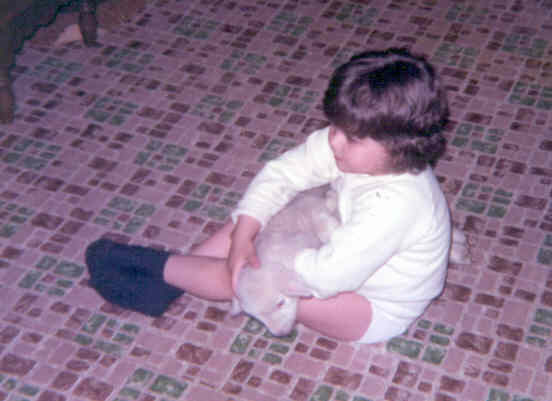 My love affair with animals began at an early age. When I was four years old, my parents conspired with my grandfather and great uncle -- both farmers -- to give me and my sister each a baby lamb for Easter. You simply cannot imagine our delight on Easter morning! We were smitten! I named my lamb Snow White and my sister named hers Flour. It was a cool spring and the lambs stayed inside with us. I can remember the lambs sleeping in a giant cardboard box next to the wood-burning stove and even sitting with us while we watched TV! As I got older, I began to better understand the cycle of life on a farm and how food arrives on the dinner table. My family had an orchard, an arbor and a large garden. My mother baked bread several times per week and made nearly everything else from scratch. We raised our own animals for food -- rabbits, ducks, chickens and turkeys. My parents also butchered hogs and even rendered the lard in a big, black cauldron over an open fire. We rounded out our diet with wildcrafted food. I remember mushroom hunting in the spring, picking wild berries in the summer, and digging sassafras roots in the winter. My father, a skilled hunter and angler, provided the table with deer, squirrel, goose, duck, pheasant, crayfish, frog legs, turtle, fish and other wild game. Despite the tranquility of such a natural life, I was deeply troubled by our relationship to the animals. Part of my daily chores included feeding the ducks, chickens and turkeys and I grew very fond of them. I would often spend my summer days under the shade of the plum trees visiting my feathered friends. I especially enjoyed two turkeys, Tom and Betty. When I sat in the grass of their open-air pen, Tom and Betty settled in on either side of me, resting their heads on my knees, waiting for strokes across their glossy backs. They loved to eat treats straight from my hand and would sit for hours listening as I read story books aloud to them. They adored human companionship so much that they would even follow me around the farm when let out of their pen. Eventually, summer turned to fall -- butchering time. Tom and Betty became the centerpieces of our family's Thanksgiving and Christmas dinners. I was devastated. On the morning of Thanksgiving I sat in my room and cried for my lost friends -- and decided to never eat turkey again. Soon I swore off chicken, as well. What began as a simple 4-H project focused on chicken husbandry turned into a personal relationship with my little flock of six chickens. I was absolutely crushed at butchering time. Each chicken had a name! How could we dine on them?! Though I had never met a vegetarian in our small rural community, I knew that a more compassionate way of living was the life for me. At age 18, I checked the one lone vegetarian book, “Laurel’s Kitchen,” out of our county library. I read the book cover to cover and overnight became a vegetarian. Now, 16 years later, I've not once regretted my decision to spare the lives of countless animals. On the farm I learned more than compassion – my mother and grandmother also taught me how to cook and bake. Both were masters in the kitchen – earning the highest praise from friends and family and even taking home top prizes at county fairs. So it is no surprise that they placed a true value on these skills and taught me well. Unfortunately, many people today choose not to cook, have forgotten how or never learned in the first place. It's surprising that even many vegans and vegetarians choose to warm up packaged food or eat out rather than cooking at home. It is time to heal this rift and reclaim the wisdom to honestly nourish ourselves. 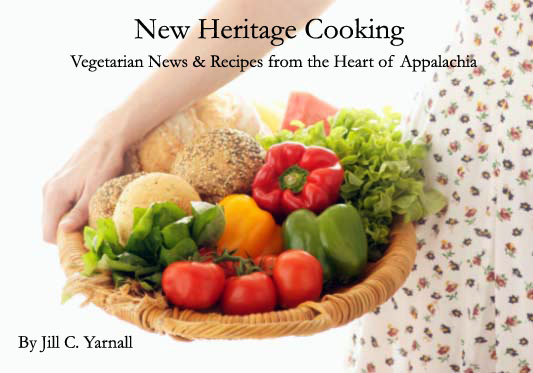 "New Heritage Cooking" brings us back to the kitchen, armed with a new paradigm of compassionate eating that is more beneficial to our health, the animals and the Earth. It is a way to deeply reconnect to traditional home-style cooking, while using new products and techniques to bring truly comforting and compassionate food to the table.